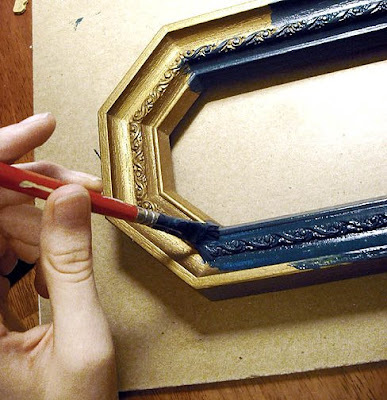 My workspace in our apartment was in dire condition, so dire that I am not showing any before pictures! 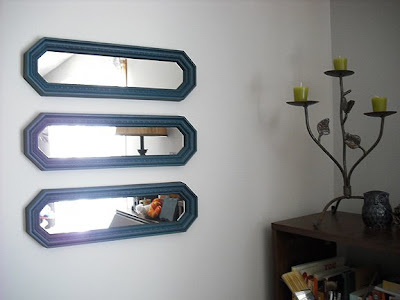 It was dark in the corner that I work in, so I revamped some mirrors I found at the thrift store to reflect some of the light from our one set of windows in the living room. New snazzy mirrors. They really do bring a lot of light to my formerly sad and lonely corner. 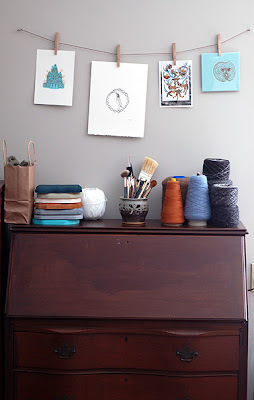 I also hung a little string with some clothespins attached to hang prints from. I have an ever expanding little print collection, and I like to rotate them in and out, so this was the perfect solution for me. Lastly, I love my secretary desk!! My Gma and Gpa C gave it to me when we moved in. It is my favorite piece of furniture. Plenty of storage in the drawers, and I can hide away all of my messes when I'm not working on something. Have a great weekend!! 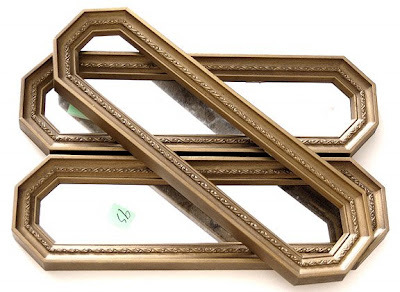 Love the mirrors, they look great being hung horizontally, I wouldn't have thought of doing it that way. Plus I am very inspired by the string, I am running out of places to put photos and string and pegs is a genius idea. I have a set of shelves beside my pc begging to have string hanging from them. 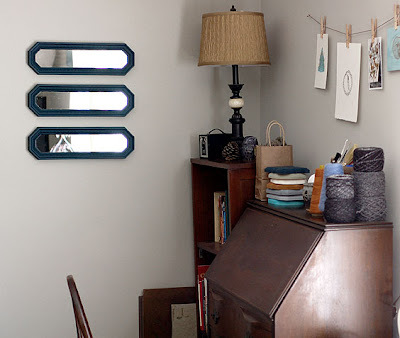 Very cool idea with the mirrors. I love that you put them horizontal rather than vertical. The string and clothespins is also awesome. my parents have a secretary desk. it used to be in my bedroom when i was young and i always played on it. I was a designer and people called to place orders for a custom dress. can i come over and play that on your desk? And yes Ann, you are welcome to come play at my desk anytime. That sounds a little naughty-hahah.